Home / Unlabelled / EARLY MORNING NEWSPAPER STAND ARGUMENT: WHY DO THEY DO IT? EARLY MORNING NEWSPAPER STAND ARGUMENT: WHY DO THEY DO IT? 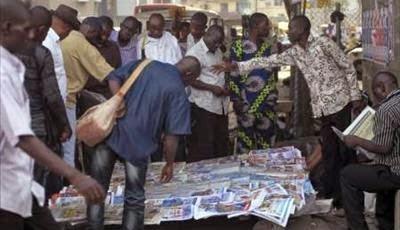 Have you ever seen people (mostly men) gather at the newspaper stand every morning screaming their lungs to dryness, arguing over everything and anything...? If you are a Nigerian, and you stay in Lagos (I don't know about other states)... your answer is most definitely going to be yes. We see them every morning! My question is, why do they do it? Does it only happen in Lagos? If you can offer some explanation... please drop a comment. I will really like to know why they do it.